It may seem like an impossible task to improve your office floor plan. After all, what do you do when your employees all want different things? In fact, whatever your industry and however much space you have available, there are a few features your office needs to increase productivity. But first, let’s look at the different options for an office layout. Open office space was introduced to make better use of space, promote collaboration, and enhance productivity. Research has found that open spaces do increase interactions among coworkers, helping communication become better and more efficient. Furthermore, people tend to be happier around others than isolated in a cubicle — this is even true for introverts. Finally, open office space allows workers to benefit from natural light and avoids the need for fluorescents throughout the day to brighten desks. Despite all the praise, employees still have several complaints about open spaces. Many workers find the layout leads to distractions or worse, especially if their coworkers view the open environment as an invitation to talk. There is also a sense of being exposed and a lack of privacy, which can make it difficult to take phone calls or carry out tasks that require confidentiality. All these factors mean that open spaces can actually decrease productivity. Closed spaces are equally ridden with disadvantages. A major problem in modern times is that space is becoming ever more limited, meaning each employee often ends up in a tiny workspace, sometimes a dark corner. Plus, even small personal spaces can be significantly more expensive for employers than an open space for everyone. It is also more difficult for managers to keep tabs on what everyone is doing — this means it is harder to notice if any employees are failing to take on their share of the work. Finally, it is difficult to promote unity in a closed space and, when several people need to work together, projects can take longer to complete due to poor communication. Having said this, there are some advantages of a closed space. For instance, some people find it easier to connect with their creative sides in a quiet, secluded space. For many, a lack of distractions (such as office gossip) can help with concentration. Finally, with no need for anyone to share a desk, employees can work to their own style — for some, a neat space leads to greater productivity, but others need everything out at once. There must be a better alternative. There is: flexible office space. This option combines the benefits of an open space and a closed space while avoiding many of the disadvantages. You can create a flexible space by adding elements of both the above types in your design, but it is better still if you switch between an open or closed office at any time. You can achieve this by using frameless glass sliding doors or with interior glass walls that you can put up when needed. Depending on the task, employees may work better alone or with others. Communal areas are perfect for sharing ideas and energy, whereas solo spaces are useful for thinking and concentrating. If what workers are doing is always changing, you need to offer a combination of places at all times, allowing workers to move to the space they prefer at any given time. If you want to also give groups a chance to escape their surroundings, you may like to throw glass meeting rooms into the mix. A frameless glass meeting room keeps groups as part of the environment while maintaining an open feel and avoiding noise pollution. Another way to enhance productivity is to keep workers comfortable and healthy. Sitting in the same type of chair throughout the day is bad for one's overall well-being. Give employees different seating options with innovative ideas like kneeling chairs, high desks to stand behind, yoga balls, and treadmill desks. All these have the added benefit of raising energy levels, especially after lunchtime. Key to a flexible office are moveable pieces, including room partitions, divides, and frameless sliding glass doors inside. 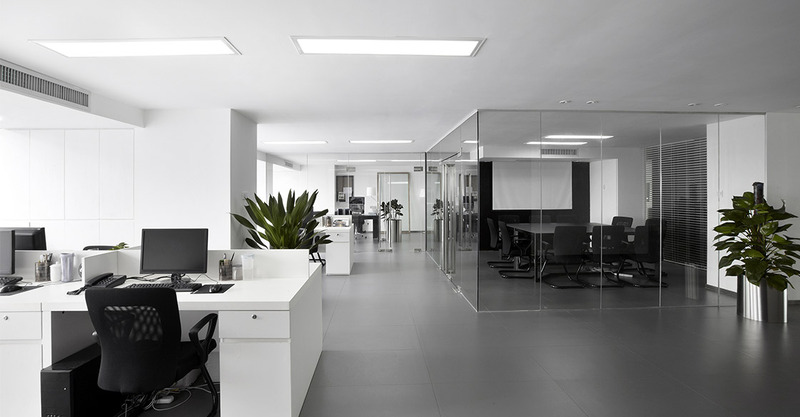 You should also consider incorporating frameless glass walls into your design, a top choice for maintaining light and a sense of space that prevents sound from traveling through the office. When creating an improved office floor plan, it is vital you think of your needs now and how they are likely to change in the future. If possible, involve employees in your planning to hear about their priorities and how they feel they could work more productively. Remember, a huge advantage of flexible space is that if you make some mistakes in the initial office floor plan, it doesn’t matter. You can easily change your layout simply by moving the frameless glass walls around until you find the perfect balance.